While working with a ClickDimensions support representative, you will sometimes be asked to enable auditing for an entity in order to track changes made to it and who made the changes. 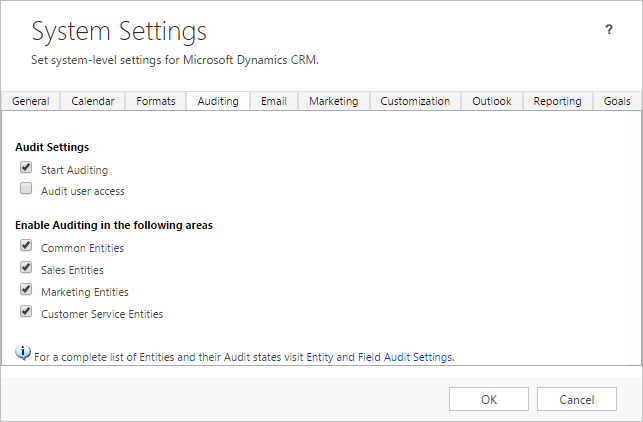 Follow the steps below to enable auditing of your Microsoft Dynamic CRM entities. NOTE: By default, auditing is disabled on all auditable entities. Log in to the Microsoft Dynamics CRM with an account that has the System Administrator role, then navigate to Settings > Auditing in CRM. In the Auditing tab, click Global Audit Settings. Under Audit Settings, click the Start Auditing check box. Under Enable Auditing in the following areas, for every indexed entities, click the [Entity] check box. In the navigation panel on the left, select an entity (e.g., Account). In the right panel, in the General tab, ensure that under Data Services, the Auditing check box is selected. Repeat steps 1 and 2 for every entities for which you want to enable auditing. Save your modifications by clicking the Save icon. Publish your modifications by clicking Publish. Where can I see auditing information in CRM? Once enabled, you can see audit history for an entity by opening the desired record and navigating to Audit History in the related menu. The audit history will let you see what changes were made to the record, who made the changes, and when these changes were made. NOTE: Audit history will only begin recording changes once auditing is enabled. Any changes made prior to this will not be listed.